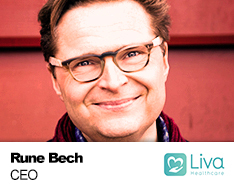 Rune Bech is the co-founder of Liva Healthcare, that is selected as a provider by NHS England for its high-profile digital diabetes prevention programme. Liva Healthcare already has a mature market in Sweden and Denmark, and are driving strong clinical outcomes through its platform for lifestyle change with a real human personal coach via an app. Rune Bech is one of Europe’s “dotcom front-runners”. Already in 1998 he co-founded NetDoctor.com, the leading European health information portal. So far he had co-founded and sold three digital health companies in 21 years, with Liva being the latest venture with offices in London and Copenhagen. As a passison Rune Bech is also the driving force behind Copenhagen’s legendary live jazz venue, Jazzhus Montmartre. – 1998: Co-founder, NetDoctor.com (health information portal – acquired by Apax Partners, Hearst Media and others in 2001-06). – 2002: Co-founder, E-Doktor (digital lifestyle management – acquired by Aller Media in 2008). – 2006: Co-founder, SundhedsDoktor (occupational health services – acquired by Falck Healthcare in 2016). – 2015: Co-founder, Liva Healthcare (digital health coaching platform – offices in Copenhagen and London). – 2001-07: Chief Digital Officer, TV 2 Denmark (leading national public service broadcaster). – 2012-15: Executive Vice President, Saxo Bank (global investment bank – Chief Digital Officer / Group Communications Officer). – 2008-2018: Chairman, Nianet (B2B fiber broadband provider, acquired by EQT in 2018). – 2007-2010: Chairman, Waoo (B2C triple play provider). – 2008-2010: Board Member, Boozt.com (fashion e-commerce). – 2003-2006: Board Member, JobZonen (e-classifieds). – 2007-2009: Columnist for Børsen (the Danish business daily). – 1997-1998: Foreign reporter, TV 2 Nyhederne (foreign news desk of Denmark’s leading broadcaster). – 1989-1997: Foreign correspondent, Politiken (Eastern Europe and London). – Since 2010: Founder and CEO, Jazzhus Montmartre (Copenhagen’s legendary live venue for world class jazz with 200+ annual concerts). Read that story here. – Since 2012: Advisory Board Member, Film Fyn (regional film council). – 2014-2016: Committee Member, Danish Ministry of Culture’s Public Service Media Committee (appointed by the minister of culture / chaired by ex-EU commissioner Connie Hedegaard). – Danish School of Journalism, University of Aarhus, University of Sussex, LSE, and INSEAD.